Norman Lozinski is the inventor and the owner of the oryginal, patented SPIDER DEVICE. Company has been certified by Polish Health Ministry. Company is cooperating with many children Institutes and Hospitals. 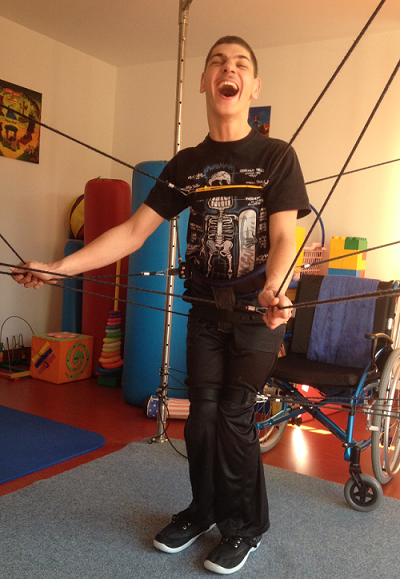 The SPIDER DEVICE consists of a number of elastic cords of different elasticity attached to certain points on the patient’s body at one end – and to the different points on the surrounding construction on the other one.This unique suspension device enables the independent and controlled movement as well as strengthening of the affected parts of the body.The equipment enables to create a unique “spider’s” web prescribed individually for each patient. 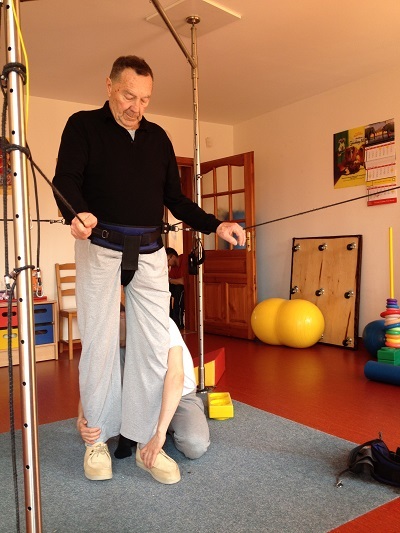 Thanks to the flexible connectors it allows to improve balance and posture as well as to introduce voluntary and precise movement of the body. The SPIDER DEVICE promotes independence with security and motivates even the most reluctant patient to participate in rehabilitation session. The philosophy of therapeutic treatment with the original SPIDER DEVICE was named SPIDER THERAPY. The SPIDER DEVICE can be combined with and assist all traditional rehabilitation methods. It can be successfully combined with most of rehabilitation and sport equipment. This unique device makes our treatment more effective since it does substitute the hands of two or three physical therapists. It allows to use the patient’s strength and abilities in fullest. The SPIDER THERAPY gains a lot of approval and acknowledgment from doctors, professional physical therapists, parents, and most important, from patients involved in treatment. The SPIDER DEVICE is found to be the most effective equipment in rehabilitation of debilitatating neuro-motor disorders, especially the Cerebral Palsy and Strokes. Implement a full course of exercises recommended by doctors in any chosen position. Exercise selected parts of the body and/or selected muscles in a controlled and proper way. Attain vertical position of the body. Perform activities of daily living such as sitting, crawling, walking. Decrease the intensity of pathological movements and ataxia (lack of coordination). Improve stability and voluntary movements of the body. Significantly improve balance and coordination of the body. Align the body in the proper way stimulating proprioceptors in the muscles and the joints. Improve the performance of the vestibular system. Teach the blind children to move and orient in space.